Animal fat is an important element of energy source and nutrition for our bodies. Within the black pig there is an abundance of lindeic acid and contains a high quality fatty acids that that helps in braking down cholesterol. The black pig meat contains ten times as much vitamin B1 than beef, and even if you cook it the vitamin will not breakdown. As for cholesterol, it contains only half of most seafood. The good quality protein makes elastic cells, which helps retain blood vessel and skin. This increase in blood flow also lessens the chances of becoming senile. Not only is the black pig a good dietary source, it is also the secret for longevity. * It is said that because black pigs are fed sweet potatoes meat retains water, which help make healthier fat. From long ago it was said that the fat of the black pig is the white meat. 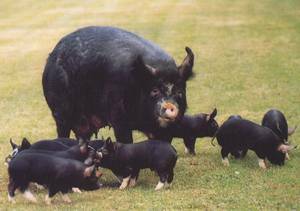 Another name for the black pig is "walking vegetable" or " healthy pork". Please try this tasty pure pork.